Vitamin B-12, or cobalamin, is needed to maintain adequate function of the nervous system and also for the productions of red blood cells or cells of the blood that carry oxygen. Vitamin B-12 is also involved in the chemical reactions of the cell; lack of vitamin B-12 indirectly causes an increase in heart rate, due to a reduction in the oxygen-carrying capacity of the blood. If you are always short of breath, it may be due to a lack of vitamin B-12, which makes it difficult for your blood to carry oxygen. All of your organs will start failing if the functioning of your heart is insufficient in compensating for the difficulty in transporting oxygen. Vitamin B-12 deficiency is also associated with diarrhea, tiredness, loss of appetite and enlarged tongue. Since vitamin B-12 is needed for adequate nerve function, severe deficiencies can also result in dysfunction of the nervous system; symptoms associated with nervous system dysfunction include an altered mental status, depression, tingling and numbness in hands and feet. A rapid heart rate is also a symptom of a vitamin B-12 deficiency, according to the University of Rochester Medical Center. Vitamin B-12 is absorbed from the diet; in the intestines, vitamin B-12 is bound to other proteins. For vitamin B-12 to absorbed, it must be detached from proteins and then bind to intrinsic factor, a substance released by cells of the stomach that produces stomach acid. Vitamin B-12 is mostly absorbed in the small intestine; according to a 2006 "American Society for Microbiology" study, vitamin B-12 is mostly absorbed in the ileum -- a portion of the small intestine, because it contains intestinal cells adapted for the absorption of vitamin B-12. 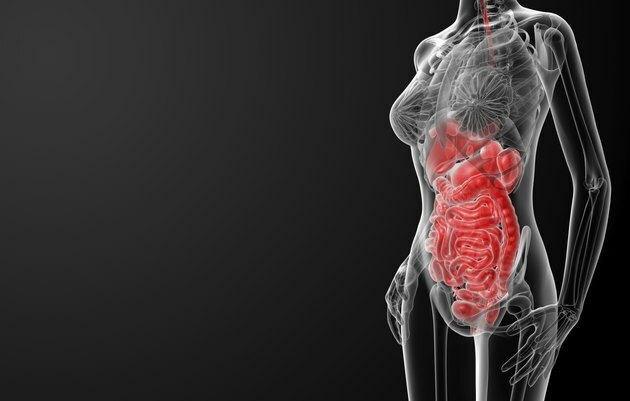 In the stomach, the destruction of stomach acid-producing cells by an overly sensitive immune system, can result in reduced production of intrinsic factor; without intrinsic factor, vitamin B-12 remains bound to proteins and is therefore not absorbed. According to a 2009 "World Journal of Gastroenterology" study, inflammatory bowel disease, or diseases associated with profound irritation of the intestines, can result in vitamin B-12 deficiency; this is likely caused by the destruction of intestinal cells adapted for vitamin B-12 absorption. Regardless of cause, vitamin B-12 deficiency causes the acceleration of heart rate due to the reduced oxygen-carrying capacity of the blood. If you experience rapid heart rate regularly, or it is becoming more frequent, you need to see your doctor to rule out serious medical conditions. A rapid heart rate can be caused by more than a vitamin B-12 deficiency, and the American Heart Association reports that a fast heart rate may be due to ventricular tachycardia, which starts in the lower chambers of the heart. Ventricular tachycardia may be due to a blocked artery which causes lack of oxygen to the heart; an abnormality in the heart structure or sarcoidosis, which is an inflammatory disease that affects body tissues, including the heart. Ventricular tachycardia is life-threatening and could result in heart attack and death.